It's the final week of Return of Project Horror! There are some good things in store this week, friends. Today and tomorrow will be the final entries from the Evil Twins & Children block of movies, and then there'll be five days of Campy & B-Movies. There are two events in particular that I'm excited about. First, if you're in Lubbock or going to be in Lubbock at 9 PM this Friday night, I'd love if you came by my place for the Rocky Horror Picture Show viewing party! Pizza, beer, singalongs... you should really be there. Leave a comment below if you want to come, and I'll get in touch with directions to my house. Second, Halloween night will be my Danny's Choice movie selection. I've done something different this year by welcoming guest bloggers, and my guest on Halloween will be a very, very special one, with a unique movie choice to bring the project to a close. I don't want to say too much else about it, because I want to preserve some of the surprise, but it's going to be one that you'll like, even if you don't like horror movies. Now, on to tonight's movie, The Bad Seed! I didn't know this when I added it to the lineup, but this movie was directed by the legendary Mervyn LeRoy (I Am a Fugitive from a Chain Gang, Quo Vadis, Mister Roberts). With movies from him, Cronenberg, Romero, and Donner in the mix this month, I feel like I've assembled something of a directors' showcase. This is one that has so deeply entered the cultural consciousness that it doesn't matter if you've seen it or not, you still know the basic story, and it's one that set the template for many movies that followed it. In fact, I would say that this movie is the standard bearer of Evil Children movies. At least Damien had an excuse; dude was the devil's kid. But The Bad Seed opened up a whole vein of movies where kids were cruel just because that was their nature. Aside from what's in the story, there's some other really interesting things surrounding this movie. First is the way that it was altered from its original source material, a novel and a play by the same name. In those stories, the mother's suicide attempt is successful, and the daughter is alive at the end of the story, with nobody else any the wiser about her true nature! When this movie was made, though, the Hays Code still governed what could be shown onscreen, and one of its stipulations was that villains can not be seen as profiting or getting away with their crimes. Second was the "curtain call" at the end of the movie. All of the cast comes out, as they do at the end of a theatrical production, and then there's this really crazy scene where the actress who plays the mother spanks the little girl. I am not making this up! Look! I've gotta say, I really liked this movie. Even though you can piece together some of what's coming, it still manages to work a few surprises into the mix, particularly about the possible origins of Rhoda's evil nature. Read into this whatever you will about my relationships with women, but I actually really preferred the character of Rhoda when she was being evil to when she was being good. It rang especially true to see Rhoda with her dad. Why? Because he is completely fooled by her facade, which her mother sees through. I have a daughter, and this is exactly how it works. My one complaint is that this movie is very stagy. It was adapted from a stage play, and it really shows. The characters all speak in monologues, and their entries and exits happen hot on each other's heels, past the point of plausibility. Still, this is a small complaint, and doesn't really detract from the movie. 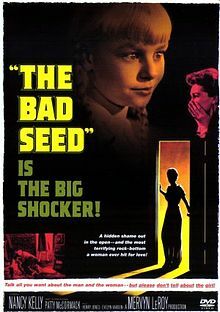 I've gone on long enough, but there's probably a whole volume on gender studies just waiting to be written about The Bad Seed. It really works on a lot of levels. I give it five penmanship medals out of five. I remember liking the Macaulay Culkin movie, The Good Son, even though critics panned it. I loved seeing such a sweet looking kid be so very evil. (Which goes back to Kyle's comment about beauty being considered a sign of "good".) And that movie, although made after the Hays Code being in effect, still has the evil child meeting his doom.